As a professional or amateur photographer, you certainly know that pictures for fashion magazines need to be perfect. Models need to have perfect skin, perfect makeup and overall perfect looks. But is that even possible in real life? Of course, not! 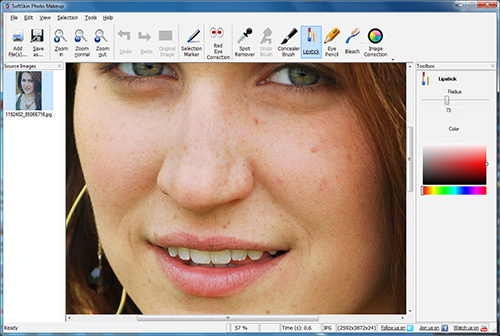 Earlier, photographers had to spend hours and hours editing pictures in Photoshop. But now you can give models in your pictures a perfect look in just seconds with SoftOrbits’ fashion retouching tool, SoftSkin Photo Makeup. Simply download SoftSkin Photo Makeup now and see how quick and easy fashion retouching can be! Upload the image or images you want to edit using the "Add file(s)" button. Zoom in the image for more accuracy. Select the tool you want to use. SoftSkin Photo Makeup features selection marker tool, spot remover, red eye correction, undo brush, concealer brush, lipstick, eye pencil, bleach and image correction tools. Apply fashionable virtual makeup by selecting the Lipstick tool first and choosing the color. Draw over the lips. 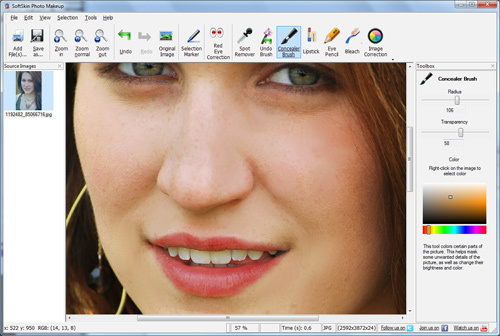 For outstanding eyes, select the Eye pencil tool and draw over the eyes, having selected the radius first. And here is a result of the retouching. Spot remover was used to remove skin defects and make skin smoother. The eyes outlined with an Eye Pencil tool. And there was a little lips makeup was made with a Lipstic tool. Which photography is more "fashion"? Save the image when you are done by choosing the "Save as..." option. You may try SoftSkin Photo Makeup now - just download free trial!